I like the extra red stripe stickers for Starscream's wings, but that's about all I would need. The other stickers are just kind of there to justify the price tag, I feel. With Soundwave, all I would want is the red eye stickers, nothing else. 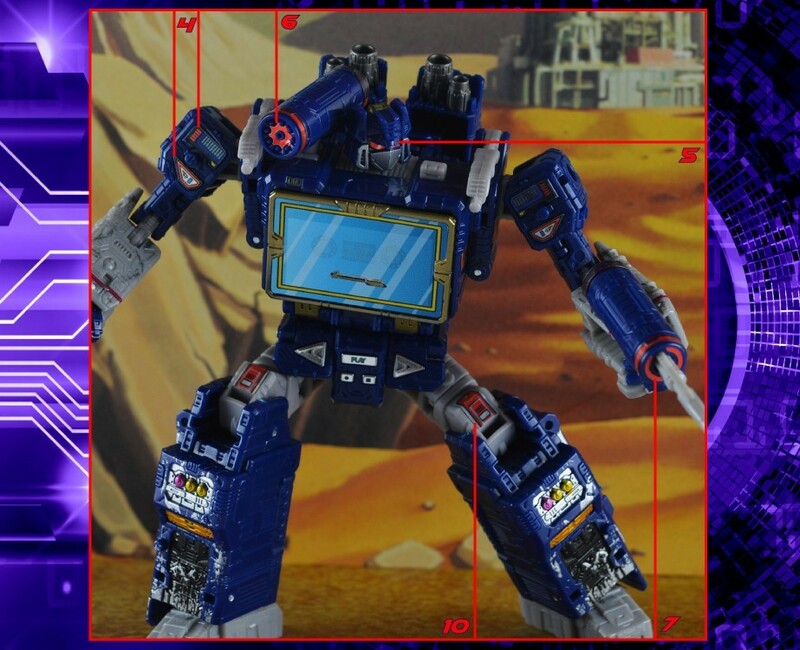 It would be nice to have a clean, non-battle damaged tape deck door for his chest, but the stark black and cel shaded window look aren't doing it for me. Perhaps the problem is that Hasbro and Takara have been doing such a good job with the decos for these Siege figures that adding details isn't really needed anymore? Wolfman Jake wrote: I like the extra red stripe stickers for Starscream's wings, but that's about all I would need. The other stickers are just kind of there to justify the price tag, I feel. I'm curious, you don't think the extra fin justifies the price? As a sticker sheet alone I wouldn't have been happy with the price (though you did get a load of labels), but the added fin, to me, makes the stickers feel like a bonus. And currently being on sale is the biggest bonus of all. Wow, I didn't even notice the extra piece for the top before! Honestly, I don't really care for it, now that I've seen it, so really, it's an extra piece of plastic waste to me, just driving up the price of a sticker set of which I'd only use about a quarter of the stickers, at best. That battle damage set is really tempting. It's really cool! 4,860 pages were recently viewed by 1,020 unique visitors. This page was viewed 2 times on Saturday, April 20th 2019 9:12am CDT. © 2019 Seibertron, Inc. DBA Seibertron.com. All Rights Reserved. Established June 2000. Seibertron.com is owned by Ryan Yzquierdo.